Mahindra Susten is the 'Cleantech' arm of the Mahindra group driven by and committed to providing state-of-the-art solutions. Mahindra Susten offers diversified services within the renewable energy and clean tech space. 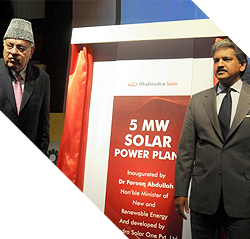 A leading player in the Indian solar energy sector, with over 544MWp commissioned to date and over 370MWp under execution, Mahindra Susten's services (previously known as Mahindra EPC) spans across turnkey solar EPC services - both utility scale solar and rooftop solar, solar DG hybrid solutions, solar products, solar car charging stations, telecom tower Solarization, solar PV O&M and analytics, engineering services, energy management services and industrial build solutions. In 2011, our operations commenced with the turnkey execution of a 5 MW grid connected solar PV project, over the last 5 years we have climbed to a dominant position in this industry. Offering the best in class solutions to the industrial and commercial segments, the cutting edge DG PV hybrid solution effectively offsets the diesel consumption and maximizes solar penetration. The company has stepped into green industrial construction with over 4,25,000 sq. ft. executed and over 7,00,000 sq.ft. under execution. The key projects include a formulation plant, Ankleshwar, Gujarat and a 2,00,000 sq. ft. warehouse at Jaipur, Rajasthan. Our team of more than 650 initiates innovation at every step to provide 360 degree smart and sustainable solutions - 24 hours a day, seven days a week, every day of the year. That is our process. That is our commitment. Powered by innovation, driven by quality and fuelled by excellence, we are uniquely positioned to enable every Indian business, household and individual to RISE with clean and smart solutions. Mahindra Susten is a part of Mahindra Partners which is the $900 million private equity division of the Mahindra group, whose mission is to accelerate value creation through a diversified portfolio of emergent businesses. Mahindra Partners adapts the group's unique strengths of constant innovation, prudence and creative business models with a mandate of incubating new ventures for the group. The division provides growth capital to bring our stakeholders diversified products and services. Our core purpose challenges the status quo. We utilize resources innovatively to breed positive changes among communities and our stakeholders. Giving Rise to the very best, every day. Dignity of the Individual- is something we treasure. Freedom of expression, in the form of disagreements or otherwise. We strive to acknowledge the time and efforts of the individual. Our actions are a cornerstone of fairness, transparency and trust. Good Corporate Citizenship - - our long-term success revolves around good corporate citizenship. Aligning our ideas with the needs of the communities we serve. Compromising on ethical business standards is never an option. Customer First - our existence and prosperity are owed to the customer. We follow a customer-is-first approach. Our response to the changing needs and expectations of our customers are always quick, courteous and effective. Quality Focus - our approach is simple and encompassing: "first time right"
Professionalism - comes from seeking and hiring the best people for the job and equipping them with freedom and opportunities to grow. Mahindra Susten aims to progress towards holistic growth and carry out business in a way that creates value for all its stakeholders. 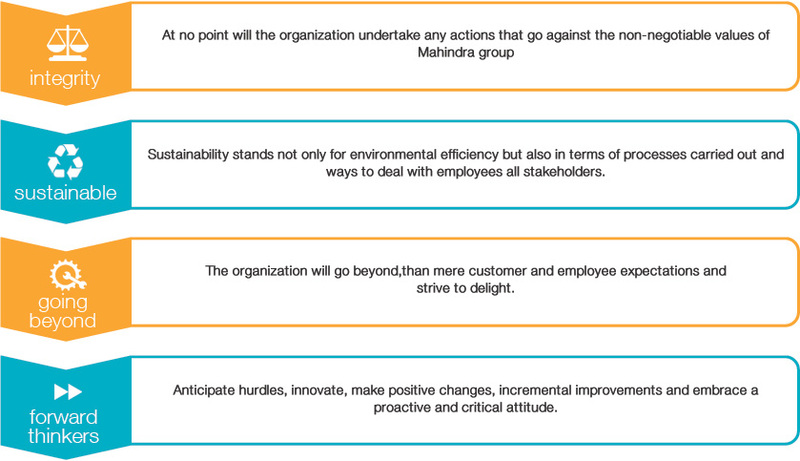 The organization follows GRI 4 guidelines for reporting sustainability. IMS certified processes are instrumental in driving sustainability at Mahindra Susten. We report as a part of the A+ rated M&M group since FY 12. Safety is a priority and hence 'near misses' are being monitored closely with 5 levels of control exercised to maximize employee safety. We are committed to the environment by creating innovative solutions to minimize impact and optimize resource conservation. Local inclusion, job creation, local hiring, skill enhancement and co-creation with local vendors is how Mahindra Susten has driven positive change and helped local communities to rise at every site location that we have worked at. Sustainability stands not only for environmental efficiency but also in terms of processes carried out and ways to deal with employees all stakeholders. The organization will go beyond,than mere customer and employee expectations and strive to delight. Anticipate hurdles, innovate, make positive changes, incremental improvements and embrace a proactive and critical attitude.